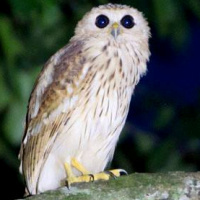 The Vermiculated Fishing Owl is a fairly large owl with no ear-tufts. Distribution: Liberia, Togo and southern Nigeria and in central Africa north from northwest Angola. Status: Uncertain. May be more common than originally thought. Original Description: Sharpe, Richard Bowdler. 1875. Ibis, 3rd Series, vol. 5: p. 260.